Welcome to Ze Cobra's website! The idea behind the information that has been posted about me on this page is to assure you that I have and will continue to dedicate myself 100% to setting health, fitness & athletic goals through the Martial Arts for our family at the Cutting Edge Brazilian Jiu-Jitsu Academy. When you become part of our family my staff, students and I are here to help you happily succeed in setting and accomplishing these goals. I came across CEBJJ 3 years ago when I was searching for a safe haven for my oldest son age 15. Within a couple of months I noticed Discipline, mental growth and Confidence. Confidence I haven't seen in him since we moved from NYC that I had to enroll my other 2 children ages 10 and 12. I admire the instructors' dedication for each student and motivational attitude used to discipline them to do better. Every student shows enthusiasm to learn new things and challenge each other within a positive atmosphere. Most important, the school provides a family ambiance which makes everyone comfortable to successfully reach their full potential. With the attitude and action of " Leave No Man Behind," I knew I had to also enroll and start my own journey with this great family called Cutting Edge. Today I was near Harrison & had the pleasure of rolling at Cutting Edge! Great school! I am a TRUCKER, travel a lot and try to roll when possible. Josef has amazing technique! One of the best BJJ Academies I had the pleasure of visiting. The facility was spotless and the level of knowledge the students possessed was incredible. I learned many self-defense techniques and small details to improve my game. Visiting this facility is a must if you're in town! I've trained in many schools before finding a home at Cutting Edge. There are no egos, great training partners, and amazing instruction. There are classes for intense training along with a great beginners program. I highly recommend Cutting Edge to anyone interested in keeping healthy, or looking to challenge themselves. Sensei, the classes yesterday were insanely awesome... I loved every minute of it, as always! CEBJJ rocks!!! 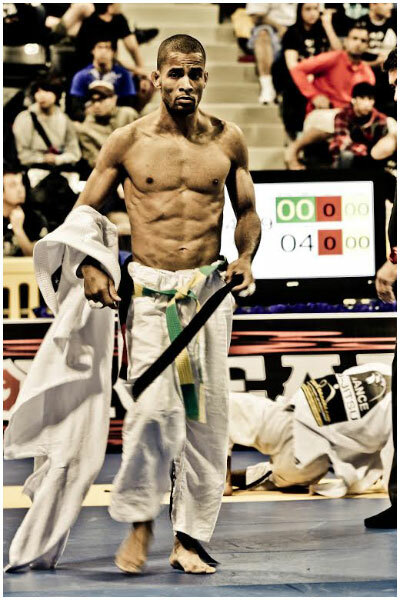 One of the Tri-State Area’s Top Athletes in BJJ & No-Gi Grappling Competitions. Professor Josef "Ze Cobra" Manuel is one of the top competitors in Brazilian Jiu-Jitsu & Submission Grappling / No-Gi in the Tri-State Area. He holds countless victories over World Class Competitors and has taken numerous titles in the Nation's Top Tournaments. His relentless and aggressive style of Brazilian Jiu-Jitsu & No-Gi / Submission Grappling has made him a favorite in the Brazilian Jiu-Jitsu & Mixed Martial Arts Community. Brazilian Jiu-Jitsu (BJJ) is a martial art and combat sport that focuses on Grappling and especially ground fighting with the goal of gaining a dominant position and using joint-locks and chokeholds to force an opponent to submit or be knocked out depending on what submission method is used. The art was based on early 20th century Kodokan Judo , which was itself then a recently-developed system (founded in 1882), based on multiple schools (or Ryu) of Japanese Jujutsu. In 1914, Esai Maeda (Japanese Judoka & Kodokan Member) was given the opportunity to travel to Brazil as part of a large Japanese immigration colony. In Brazil, in the northern state of Para, he befriended Gast�o Gracie, an influential businessman, who helped Maeda get established. To show his gratitude, Maeda offered to teach Judo to Gast�o's oldest son, Carlos Gracie. Carlos learned for a few years and eventually passed his knowledge to his brothers. At age fourteen, Helio Gracie, the youngest of the brothers moved in with his older brothers who lived and taught Jiu-Jitsu in a house in Botafogo, a borough of Rio de Janeiro. Following doctor's recommendations, Helio would spend the next few years limited to only watching his brothers teach as he was naturally frail. One day, when Helio Gracie was 16 years old, a student showed up for class when Carlos was not around. Helio, who had memorized all the techniques from watching his brothers teach, offered to start the class. When the class was over, Carlos showed up and apologized for his delay. The student asked for Helio to continue being his instructor, Helio Gracie then gradually developed Gracie Jiu Jitsu as an adaptation from Judo. Helio Gracie also held the rank of 6th dan in judo. Submission Grappling is a new sport with a long history. The object is to submit your opponent using a variety of joint locks and chokes, or to win the match on points. Competitions in this sport resemble Brazilian Jiu-jitsu competitions, although competitors do not usually wear gis. This lack of gi increases the amount of speed and athleticism required, and it also limits the sweeping and submission options of the competitors. Submission Grappling is mainly based on Brazilian Jiu-jitsu. Brazilian Jiu-jitsu descended from pre-World War 2 Judo, which itself was heavily influenced by the classical Ju-jutsu systems of medieval Japan. The influence of Brazilian Jiu-jitsu can be seen in the types of positions and submissions most commonly used in the sport. Other grappling arts have also influenced Submission Grappling. The most common takedowns come mainly from freestyle wrestling. The prevalence of leglocks also shows the influence of such arts as Sambo. Many of the top Submission Grappling competitors also compete in mixed-martial-art or no-holds-barred competition, and this brings a certain intensity to the sport.